The collected papers from this symposia provide scholars, students, and practitioners with access to the newest work of top tier scientists in psychology. Volume 35 addresses issues relevant to disorders of development and presents their processes and findings. It covers the translation of research on learning, attention/attention deficit, and early conduct problems into practice at a clinical and policy level. In addition, it explores cutting-edge issues in the field, heralding critical up-and-coming areas of scholarship. 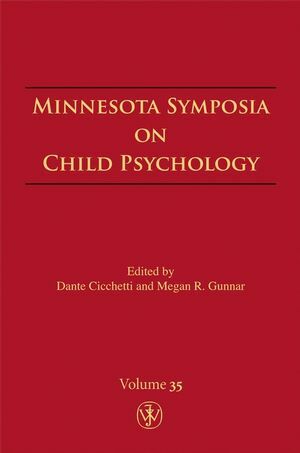 Academic researchers in developmental psychology, as well as developmental psychopathology will look forward to this volume. Dante Cicchetti is McKnight Presidential Chair and Professor, Institute of Child Development at the University of Minnesota. Professor Cicchetti's major research interests lie in the formulation of an integrative developmental theory that can account for both normal and abnormal forms of growth. Megan R. Gunnar is Regents Professor and Distinguished McKnight University Professor at the Institute of Child Development at the University of Minnesota. Her research focuses on how children react emotionally and socially to stress. 1. Meeting the Challenge: Opportunities, Roadblocks, and Detours (Megan R. Gunnar and Dante Cicchetti). 2. Roots of Social Cognition: The “Like Me” Hypothesis (Andrew N. Meltzoff). 3. Attention, Joint Attention and Social Cognition: Lessons Learned from Research on Autism (Peter Mundy). 4. Enhancing Self-Regulation in School and Clinic (Mary K. Rothbart, Michael I. Posner, M.R. Rueda, Brad E. Sheese, and Yiyuan Tang). 5. Learning is Not a Four-Letter Word: Changing views of Infant Language Acquisition (Jenny R. Saffran). 6. The Emergence of Emotion: Experience, Development, and Biology (Seth D. Pollak). 7. What Are Little Boys Made Of? Snips & snails & puppy dog Tails: Etiological Bases of Conduct Disorder and Related Conduct Problems (Elena L. Grigorenko). 8. Translational Issues in the Development and Prevention of Children's Early Conduct Problems: Challenges in Transitioning from Basic to Intervention Research (Daniel S. Shaw).